Brain fog is mentioned many times in blogs and books and articles, but what is it? A survey of each of us at our GAPS meeting indicated that it is altered consciousness and decreased mental alertness/function that can occur quickly and be persistent. We all agreed it could be life threatening while driving. It was compared to “chemo brain” in our group and also in blogs. An article online on WebMD offered advice such as being more organized, writing things down, and basically, learning to live in spite of it. In our group discussion we tried to identify triggers. Some that we felt were key were sleep deficit, stress, and eating food away from home that had questionable, unknown ingredients. It seems apparent that toxins are an issue with brain fog; either ingestion of too many or our body’s ability to eliminate them are compromised. Most likely both. For example, none of the systems of our body work as well when sleep is compromised, so ingestion of toxins after a sleep deficit might be more likely to induce brain fog than if those same toxins were ingested while being well-rested. The most important thing with brain fog is to address it in a safe way. If plagued with it while driving, taking a break is imperative. Great discussion! Hopefully we can each incorporate more simple detoxification into our daily lives. Lots of great questions and comments! Samples: lacto-fermented coleslaw, Beet/ginger fermented cabbage, bone marrow custard, and second ferment blueberry/elderberry/mulberry kombucha. Diverting fruit flies from kombucha: put a small glass with ACV and a few drops of soap next to the kombucha. As always, so many questions, so many interesting comments, so little time. Until next time…. “Everyone tells me that they find the Fermented Cod Liver Oil very strong tasting. Older kids and adults take the capsules if they have a strong aversion to the taste. But, I do warn the families that capsules are way more expensive and you need to take 5 capsules for 1 teaspoon of FCLO. The most popular flavours of my clients and kids are plain, cinnamon tingle and chocolate cream. I prefer the cinnamon tingle as it tastes like those sweetheart candies, that have a strong cinnamon taste. Younger kids cannot swallow the capsules and often have a huge aversion to the taste, if they have sensory issues. Dave Wetzel at Green Pastures says he lubes the buns of his 2 year old with FCLO. I have never tried that one. But, my kids like when I hide their dosage in a mixture of coconut oil and honey. Mix a small amount of honey into the softened coconut oil. Drop teaspoonfuls of the coconut oil/honey mixture onto Parchment paper. Place 1/4 or 1/2 tsp of FCLO onto each coconut piece and form the coconut oil/honey mixture around it, so that the FCLO is in the center. Place the paper into the freezer to harden. Then, when it is time to take their FCLO, they line up and I drop a frozen ‘candy’ onto their tongues and they just let them slide down their throats, without biting into them. This year I am honored to be hosting my in-laws on Christmas Day. One of the treats I will serve is an old family recipe – Sauerkraut Salad. Today, in the 7th year of my Weston A. Price nutrient-dense-food-journey, I relish making this salad – with appropriate modifications., of course! Instead of “2 cups of sauerkraut” (Franks in a can because it was at the local store and cheap), I lavishly share 2 cups of our very own raw, Pickl-it sauerkraut that as been brewing in our cold room since August. The recipe, in my mother-in-law’s distinctive, beautiful cursive handwriting, calls for “draining” the sauerkraut. Gasp! Discard all of those enzymes, vitamins and minerals? Instead it was substituted it for some of the apple cider vinegar. The vinegar, which is raw, organic, and unfiltered instead of the imposter I used to pick up in a plastic jug. The “medium onion, chopped” is fresh from my garden. Pimento is from the freezer, also a garden item. A half cup of raw honey is substituted for the “cup of sugar” – organic, without any high fructose corn syrup. The oil is organic olive oil purchased from a trusted source, NOT rancid soybean oil laden with pesticides. This is a Weston A. Price approved recipe AND it is GAPS friendly as well. …..Wonder what my in-laws will think…. Everything you need to know about making broth. Broth PP– Make your own broth easily by following these hints and pictures. ((click here for) R-E-L-I-E-F)? Gas, bloating, constipation, digestive woes…. 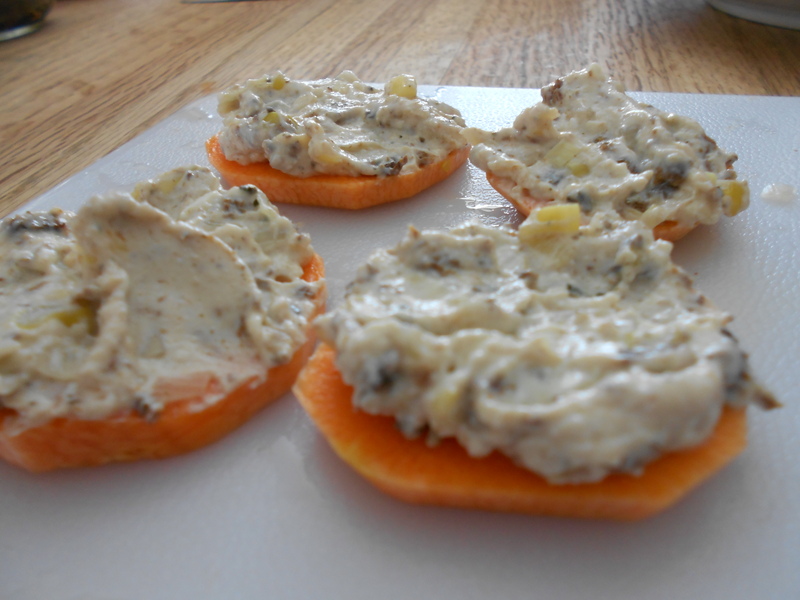 Cream cheese - smoked oysters - fermented onions on a carrot "cracker"
Today I used Flax seed “gel” to fix my hair. Honestly, I looked the best I have in days! Bring the cup of filtered water to a boil. Stir in the flax seeds, turn down the heat to medium and let simmer for between 7-10 minutes. *Do not simmer longer than 10 minutes else you won’t be able to strain out the flax seeds from the gel. Strain out the flax seeds using a strainer or cheesecloth and let the gel cool. Mix a few drops of essential oils and/or aloe vera if desired. Pour gel into a small bottle and refrigerate.